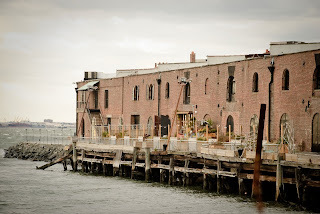 The "Real World: Brooklyn" digs on the Red Hook waterfront. It seemed like just yesterday we were writing about "The Real World: Brooklyn" setting up shop in Red Hook (for that story, see after the jump). Now, tonight marks the season's last episode. This past season saw the eight strangers pursue their own passions - from promoting LGBT rights to doing the typical come-to-New York-to-be-a-model thing. Missed some - or every - episode? MTV's Web site has each episode available for viewing. And Gawker viligantly recapped all the drama, with some liberties (find last week's here). The episode airs tonight on MTV at 10 p.m. (with repeats broadcast seemingly hourly after that), followed by “The Real World: Brooklyn Reunion Special” at 11 p.m. Living in a converted warehouse on a Red Hook pier overlooking the Statue of Liberty – that’s the life of a typical Brooklynite. Wait, what? For the last three-and-a-half months, the eight – yes, eight – roommates lived in a warehouse on Pier 41, right down the block from Steve’s Authentic Key Lime Pie shop. Located behind a tall chain link fence meant to keep the locals out, the “house” is outfitted with bright Ikea furniture, graffiti artwork by Brooklyn painters, a private Crunch gym, and has sweeping views of the bay. There’s even a makeshift “beach,” which is really just a pile of sand, and a patio facing Lady Liberty. “We appreciate what we have,” Ryan, an Iraq veteran, told this paper during last week’s meet and greet with reporters. “I’m coming from San Francisco where I live in a shoebox. I feel so blessed,” said Sarah, the tattooed, Oxford-educated roomie. Sitting on the bed in his Grand Army Plaza themed bedroom, which has a gorgeous floor-to-ceiling window facing the water, Ryan said the cast visited friends in more typical Brooklyn digs – the ones that combine a living room and kitchen into one tiny area. “One of my friends lives in Brooklyn so he showed me the real Brooklyn,” Ryan explained. “I spent the majority of my time in Park Slope on Fifth Avenue and at Harry Bolands – loved that bar,” Ryan said. Living in an industrial neighborhood like Red Hook took some getting used to. “There’s a perception that this is a very, very rough neighborhood but people really look out for each other,” said Katelynn, who is the show’s first transgender cast member. “It was nice to be in the city but because we were in Brooklyn and on a pier, we got to spend more quality time together,” said J.D., a dolphin trainer from Miami. Since none of the roommates previously lived in Brooklyn, they had preconceived notions about the borough. “I didn’t know much about Brooklyn,” admits Chet, a Mormon and conservative Republican from Salt Lake City who says he’s metrosexual – not gay. “I needed to figure it out,” he said. After a few trips to pretty Park Slope and banging Bensonhurst, Chet’s fears disappeared. “I love it. I love the way people dress. I love the clubs. I love the music,” he said. On the second day of filming, the Lordz of Brooklyn, a hip-hop/punk band from Bay Ridge, gave the roommates a tour of the borough’s hot spots. One of their first stops was L&B Spumoni Gardens on 86th Street. “The cheese to sauce ration was quite excellent,” Sarah said. The roomies often ventured to Downtown Brooklyn in search of bargains. “Half of my wardrobe is from Fulton Mall. You can get so much there hella cheap,” Sarah said. But, of course, they were regulars at the giant supermarket just blocks from Pier 41. The cast took a trip to Coney Island shortly before Astroland closed its gates for the final time and fell in love with the gritty amusement park. “I got to shoot the freak,” Ryan said proudly. “The first time I shot him, I got him right between the eyes,” Chet chimed in. The roomies tried to check out the Sideshows by the Seashore but were shooed away by a man screaming “Get those cameras out of here,” Scott recalled. They were particularly dismayed to learn that Astroland’s glory days are over and mega-developer Joe Sitt wants to build a glitzy, Las Vegas-like entertainment center. Some Brooklynites said the same thing about “The Real World” cast. When news spread that MTV wanted to film its famous reality show in Red Hook, the locals were none too pleased. Many bars refused to let the crew film in their watering holes and Brooklynites, especially hipsters in Williamsburg, were less than welcoming. Now that filming is over, four of the roomies are sticking around – but moving across the river. Chet is moving into his brother’s apartment on the Upper West Side, and Baya, Devyn and Scott will share a place in Stuyvesant Town. They all swear that they love Brooklyn – “There is so much Brooklyn pride,” Baya gushed – but say they’re relocating to Manhattan to be closer to job opportunities in television, music, fashion, modeling and acting. The Brooklyn show marks the 21st season of “The Real World,” which had its heyday when filthy Puck went head-to-head with AIDS activist Pedro Zamora in San Francisco. According to Devyn, “Real World” producers said the Brooklyn cast is less like the trashy Las Vegas bunch and more reminiscent of the show’s first season in New York, which featured aspiring writers and actors. The first episode of “The Real World: Brooklyn” will air on MTV on January 7th at 10 p.m.